Search results for "Adolf Loos"
There are six clear reasons why Turncoats, a new architectural debating format, is continuing to ruffle more than just a few feathers in Hoxton, East London. 1) It is free. 2) You are given a bottle of craft beer upon entry. 3) A musical comedy act featuring a game of "Hitler or Ham" introduces the evening. 4) The audience must do a shot of vodka before the debate. 5) An intellectual debate on whether ornament is crime proceeds and 6) everyone cheers at the end and goes home smiling. All very well, but what was the result of all this? As tempting as it is to go into detail over the "Hitler or ham" debacle, the real issue in Hoxton Hall on the 27th January was the debate on whether the statement "ornament is crime" is a crime itself. In order to solve this, three panels were put in place with two arguing for and against and the other an independent adjudicator dubbed "Switzerland." And so Adam Nathaniel Furman, architect, furniture designer and founder of the Postmodern Society, stepped forward with the first of what would be four prewritten arguments. Here, he compared ornament to wearing clothes, inferring that dressing our buildings is no different. Further still, ornament evokes a sense of freedom, liberality and identity. "If form was really so pure, we should all walk round naked!" Furman exclaimed. We dress up to represent our ideals and what we stand for and architecture should do the same he concluded. To counter this, Studio Weave co-founder Jane Hall retorted that ornament hides a building's true identity and distracts us from the faults and failings of reality within the built environment. A window decoration, for example, guides our gaze from the cracks in the pavement and potholes in the street. Money is hence more willingly spent on splendor rather than maintenance of our everyday basic needs when the opposite should enforced. Now, the debate was in full swing, and up stepped fashion satirist Bertie Brandes who wasted no time in slating those against decoration. “Minimalists are basic b*****s to the highest degree.” Interestingly, Brandes pointed out that ornament is literally a crime in rented accommodation whereby nailing a picture in to the wall can break the tenancy agreement. From this we can take solace in the fact that implementing decoration is indeed part of the great struggle against the "facist" orthodoxy. “Why should we let architectural class dictate the aesthetic of our cities?” Brandes questioned, suggesting that ornament can help aesthetically democratise our built environment. Finally, Rory Hyde, curator of Contemporary Architecture and Urbanism at the V&A Museum in London, came forward. Like Brandes, he was quick to make an equally sweeping statement: “Ornament is just s**t smearing” he said. Hyde went on to say how Donald Trump's home/palace is rather heavily decorated, posing the question (albeit not so seriously) that to endorse ornament essentially means that one also endorses his policies. However, Hyde later went on to say that the the thing about real palaces is that they do have power and indeed are the pinnacle of ornamentation. With real monarchial palaces, you are always born into them and hence ornamentation is inherently classist. After some light-hearted exchanges, somehow moderated by Charles Holland (co-founder of Ordinary Architecture), the debate eventually boiled down to fascism versus democracy. AN also weighed in on the debate, posing the following dilemma: “In which of the two scenarios is the most powerful ornamental statement made? Scenario One, a street full of flamboyant, heavily decorated structures juxtaposed by one minimalist building, or Scenario Two, a street full of minimalist structures, all uniform in style juxtaposed by one flamboyant, heavily decorated building?” Furman was quick to respond. “I like this idea, in a sense you think of it being similar school uniforms as we dress our buildings. On school days, we all have to look the same, but on the weekends we get to wear what we want.” Hence, freedom only becomes liberating when one is oppressed or when one has the knowledge that one will be oppressed in the future (like on Monday, once the weekend is over). As the evening progressed, the case for ornamentation became stronger. Ornament can be useful for way-finding, it was said using the example that taxi drivers use ornamentation on buildings to guide them around London. Hyde pointed out that while Aravena despises ornamentation, he lets the occupants of his buildings dictate their own ornamental style. Decoration from the user symbolizes pride of place and lets the place become their own. Hyde continued, noting that on the flip side of this, how much choice or freedom do we really have to make it our own? Most look to IKEA to furnish their dwellings. To be truly democratic or liberated would be to make the furniture ourself. Furman essentially closed the lid on the debate. “We pretend that modernism is the pioneer of neutrality, looking at everyone as equal. It may do this, but in doing so just perpetuates a power struggle within this society. Instead, let’s celebrate our differences.” At the end of the evening, with many of the audience drunk on well-presented architectural arguments on ornament (and slightly tipsy from the alcohol) the statement “ornament is not crime” got the biggest cheer. Democracy had triumphed and we were all architecturally liberated. Block of flats with OKO cinema. As Modernism spread across the globe in the early 20th century, its vision of a totalizing, unifying way of making architecture was never fully realized. Instead, many of the tenets of the movement were “absorbed” into distinct local, regional, and national cultures. Prague, in the modern-day Czech Republic, is perhaps one of the more complex contexts that inherited these international influences in its own particular way. Currently on view at the Center for Architecture in New York is Prague Functionalism: Tradition and Contemporary Echoes, a look at the Czech Functionalism of the 1920s and 1930s, and its influence on contemporary Czech architecture today. Prague at that time was rapidly modernizing as it grew from a provincial city into an international metropolis. It was uniquely situated in Czechoslovakia, at the intersection of the East and the West. The exhibition is two-fold: The first part focuses on the 1920s and 1930s and the intellectual history that brought architectural modernism to Prague from outside influences including the Bauhaus, Adolf Loos, Mies van der Rohe, and Le Corbusier, as well as movements around Europe such as Purism, Constructivism, Rationalism, and Functionalism. Much of the outside influence was brought in by Jan Kotera, who was a student of Otto Wagner’s in Vienna. Euro Palace, on Vaclavske Square, is adjacent to 1920s department stores (left). 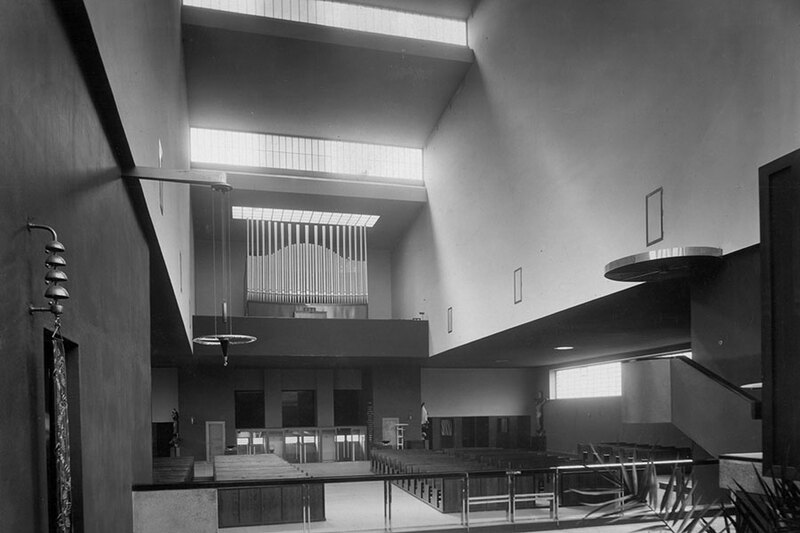 Interior of St. Wenceslas Church, designed by Josef Gocar., and this is another caption (right). The second part of the exhibition shows how the period is being resurrected as a new contemporary Czech architecture. After the fall of the Austro-Hungarian Empire at the end of World War I, Prague was free from outside rule, and became a center of progressive modernism. This freedom was lost after World War II, when the country was subjected to a USSR-backed regime that oppressed Czechoslovakia until the fall of the Berlin Wall in 1989. It was then that the interwar period of independence became the source of reference for architects looking to continue Czech Functionalism. Individual buildings have specific borrowed motifs that can be traced throughout, including formal references like the austere white boxes of Adolf Loos, the ribbon windows of Le Corbusier, and the restrained, technologically charged minimalism of Mies. The functional innovations of the time were cultural, representing the Czech way of making buildings. Programmatic organization is often borrowed, such as in Atelier 8000’s family housing at Hanspaulka, where individual buildings are gathered into a tight complex, recalling the famous Baba Villa Colony of the 1930s. 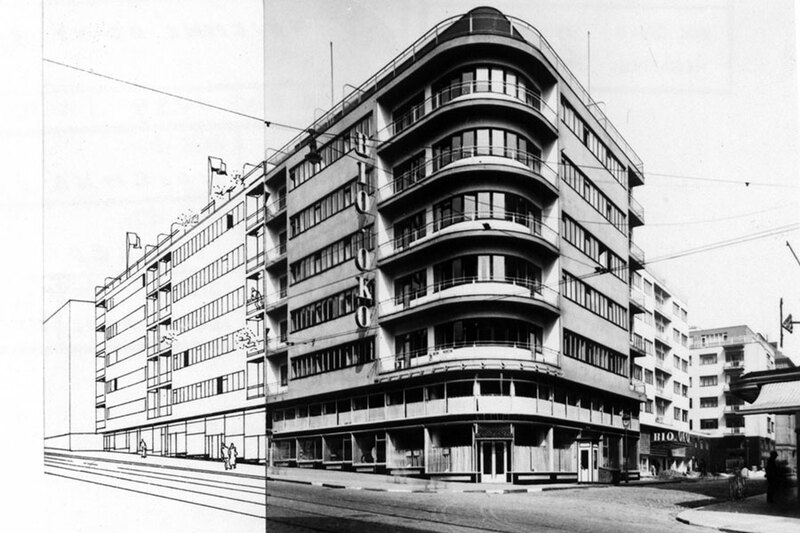 Additionally, the respect for this architectural heritage can be seen in contextual responses when contemporary buildings are built near existing modernist icons, such as the Euro Palace on Vaclavske Square, which sits alongside two 1920s department stores. The exhibition itself is full of wonders that are worth seeing simply as single artifacts. A full-scale plan is printed on the floor of the Center, with furniture to give scale to the unit. It is an apartment unit by Ladislav ák, inspired by theorist Karel Teige’s ideas on minimum collective housing and his book, The Minimum Dwelling. The unit could be read as the Czech equivalent of Margarete Schutte-Lihotzky’s “Frankfurt Kitchen” and the German existenzminimum—minimal existence—that it manifested. In ák’s version, it was the whole apartment where unnecessary space and movement was eliminated, making the home into a functional ideal. Several models were flown in for the exhibition, including an intricate gray-scale representation of the Hanspaulka Villas by Stanislav Fiala (2009), complete with details such as wire mesh that covers an outdoor walkway. Fassadentwerf, conceptual drawings from 1921, by Vit Obrtel show the experimental nature of the otherwise dry Functionalism. 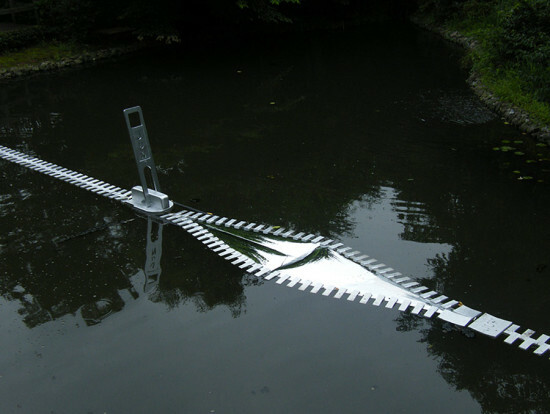 His designs are made of planes that curve into one another, creating a highly complex facade from what would be a relatively simple construction technique. The exhibition’s strongest point is the coherent and large selection of historical buildings and their contemporary echoes. Each floor shows strong conceptual and pragmatic through-lines. The two parts remain very separated, however, and they are grouped by building type. It would be interesting to see how the simple display—large-scale prints hung on the wall—could have been manipulated to more directly illustrate particular similarities between the two eras. The exhibition gets the details right throughout its broad selection of projects, but the complex and fascinating political background of this material is downplayed significantly. For example, the 19th century “Parade of (Neo-classical) Styles” that prefaced modernism played out in a unique way in Prague as the International Style was rejected by Czech Nationalists as oppressive because it had its roots in Vienna, the cultural center of the Austro-Hungarian Empire that ruled over Czech lands at the turn of the century. Nonetheless, this is a tightly executed and interesting show that could likely serve as a prototype for future exhibitions focused on other contexts where modernism continues to influence local architecture. If the 2014 Venice Biennale was about “Absorbing Modernity,” perhaps this show is about “Extending Modernity” into the 21st century. The exhibition, Ways to Modernism: Josef Hoffmann, Adolf Loos, and their Impact at the MAK brings together the work of these two architects and places them in a historical context of the rise of mass production in the 19th century, work of Otto Wagner as their predecessor, and the urban transformation of Vienna. The exhibition also situates the works of Loos and Hoffmann as trajectories within modern and contemporary architecture culture, tracing their design strategies to the present in the works of artists, architects, and designers. In this respect, the exhibition treats history as a living process, making connections throughout two centuries. This year marks the 150th anniversary of the MAK and of the Ringstrasse, an important institution and an important urban artifact in the history of modern architecture, design, and urbanism. The exhibition places the work of these designers within a milieu of things, goods, and objects, which were designed for mass production and consumption. Hence viewers can see the new materials that came about, such as plastics and meerschaum, furniture and fabric catalogues, and manufactured porcelain and textile products. With these artifacts the story of the rise of mass production is placed within the context of Austria and Central Europe. The work of Otto Wagner, from his urban plan for Vienna to his furniture designs for the Postal Savings Bank, is placed within this culture of things as the predecessor of the two figures. Loos and Hoffman, then, become the figures who both worked within and against that culture, looking for ways to redirect it. 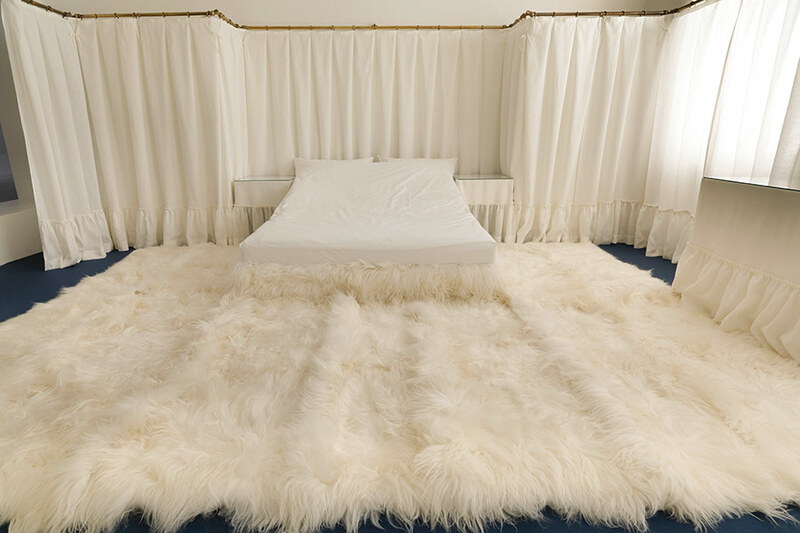 The centerpiece of the exhibition is two bedrooms: one by Adolf Loos for his wife, Lina (1903) and one by Hoffmann for the Salzer family (1902). Where Loos provided a structure and rails along the walls both holding different kinds of fabric, Hoffmann designed every item in the bedroom with the same geometric pattern. Here are two different ideas of surface, ornament, and materiality. Loos’ bedroom is an all-over surface, a cladding with the furry fabric covering over horizontal surfaces (floor, bed frame) and the curtains along the rails covering the vertical surfaces. Hoffmann’s bedroom on the other hand consists of scaling and playing with the same geometric pattern in different materials, on different objects, from the carpet and the bedsheets to the night table and the bed. The contrast of the sensous fabric of Loos to the abstract geometric pattern of Hoffmann also corresponded to contrasting views on the designer’s role: minimal intervention versus total control. Josef Hoffmann’s Boudoir d’une grande vedette for the Paris World Exhibition, 1937. There are other one-to-one scale reconstructions of rooms and spaces in the exhibition: Margarete Schutte-Lihotzky’s design for an apartment for a working single woman (1928) and Hoffmann’s design for a boudoir of a movie star (designed for an exhibition in Paris in 1937). These one-to-one reconstructions well display the sense of the relationship between things and objects of modernism and the spaces and the lives that had to be crafted, designed, and accommodated at the same time. In an attempt to recreate the intimacy of these worlds, the exhibition also presents some of the different forms and spaces of privacy in modernism. One of the goals of modern design, as the exhibition reminds us, was to organize, protect, or enhance that world. Yet there is also information on how these private lives would become public, in the example of several public statements by architects, public housing projects in and around Vienna as well as the history of urbanism in Vienna. The exhibition concludes by tracing Hoffmann and Loos’ positions into the contemporary world of architecture. Following figures like Hans Hollein and Donald Judd, Lacaton & Vassal, Werner Neuwirth and Anna Heringer are presented as employing Loos’ different design strategies of ready-made, raumplan, and Do-It-Yourself. In this respect, the exhibition has a bias toward Loos, and this is Loos read as an architect who developed different strategies in different contexts. Yet one thing the exhibition and the history it portrays shows is that so much of Loos and Hoffmann’s work have something to do with carving out a space for privacy and finding ways of public appearance, where Loos presents clear cut boundaries between public and private. Perhaps in tracing the trajectory of these two figures, the question that remains is what are the new private worlds, and how does architecture articulate these worlds? Perhaps this question could also expand the final positions presented in the exhibition. In presenting a historical context through things and objects and placing architecture within that context, the exhibition brings forth a fresh history of an important moment in the history of modernism. In further emphasizing the role of design in the society, in positing that there are different ways that design can be social, the exhibition puts forward important questions. The Polish Pavilion imagined Rem Koolhaass tomb. In contrast to Aaron Betsky’s 2008 biennale, Architecture Beyond Building, this one—the Central Pavilion, at least, with its taxonomies of staircases, wall panels, and toilets—could be thought of as “Building without Architects.” It offered a reset of sorts, and perhaps a breath of fresh air, for a discipline that might be accused of occasional fits of decadence. In true Koolhaas fashion, it was a provocation, and not seeing it as such would be missing the point. But perhaps it could have gone further. Koolhaas has likened the theme “Absorbing Modernity,” which he imposed on all the national pavilions, to the way one might absorb a blow or punch. What this neglects—and what many of the pavilions showed, to their credit—was how 20th century modernity was in fact resisted, instrumentalized, and transformed by its “receivers.” They punched back, and perhaps it was modernity that absorbed them. Aric Chen is the curator of architecture and design for M+ in Hong Kong. a Poster by Marysia Lewandowska. Rem Koolhaas says that “the ideology of the market should dictate innovation and is the ultimate arbiter.” In fact this ideology is nurtured by some politicians and economists today. The economic and social reality of the marketplace is always a compromise between the law as written by politicians and their corporate sponsors and the dynamics of a particular social/economic reality. Our responsibility as architects is to unveil this misleading ideology and not accept it at face value—cynically propagating the free market myth and speaking in terms of self-organizational urban strategies or a market driven view of history. What I enjoyed at the Bienniale was how some of the national pavilions responded to Rem’s theme of the last hundred years of “national” architecture. Ironically, only two pavilions were closed. Australia because it was under construction and Venezuela’s beautiful pavilion designed by Carlos Scarpa in the 1950s was closed and used for storage by its neighbor the Swiss pavilion. Carlos Brillembourg is a New York-based architect and critic. The world’s most important non-commercial architecture event has been too much a showcase of buildings by leading architects and too little a debate about architecture at large. Exit architects. This year’s director, Rem Koolhaas, makes very clearly his points—a talent retained from his journalistic background. He delivers a media-friendly and thought provoking—though somehow unfinished—Biennale. His robust curatorial presence results in a consistency that has not been seen in the Giardini for a while, producing remarkable national shows, including standouts from France, Korea, and Britain. The Monditalia journey to contemporary Italy, all magnificence and decay, recalls the Strada Novissima, brilliantly if only a touch shabbily, inhabiting the Corderie. 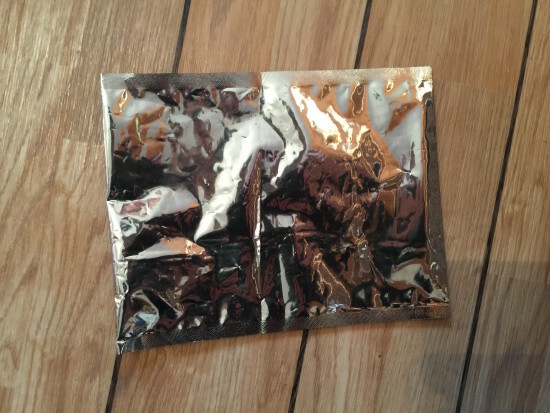 Elements is less convincing. Encyclopedic, un-exhaustive, ironically Beaux Arts, it explores and dissects the elements of architecture. It fails to address the syntax and only marginally addresses its invisible aspects. The unoptimistic message may be that architects lose power to the idolatry of health and safety and regulations. That parametric design is, of course, irrelevant. Alessandra Cianchetta is an architect based in Paris. At the Polish Pavilion, dedicated to memorials, there’s a wall of photographs of architects’ tombs: Adolf Loos, Mies van der Rohe, Plecnik, Scarpa, Le Corbusier, Aalto are all there. High up, next to Loos, is an uncaptioned photo of what can only be Rem Koolhaas’s tomb. Did Koolhaas notice? But in truth, it’s not the CCTV building but the Biennale itself that is Koolhaas’s tomb. The voracious amassing of data, and yet more data, has finally caught up with him in Elements: part trade exhibition, part ethnographic collection of every kind of incident to do with walls, floors, windows, balconies, roofs, ceilings etc., this display that had seemed so promising, turns out utterly indiscriminate in its selection, positively bulimic in the endless accumulation of information without focus or apparent purpose. The architect is buried, not beneath the CCTV building, but under the sheer mass of unassimilated data that has been brought together. Adrian Forty is a writer based in London. This Biennale is a “great exhibition” in the tradition of the legendary Swiss curator Harald Szeemann, in which everything is tied to a central concept—in this case modernity. Koolhaas’ concept of modernity is not a project, but an irreversible, globalizing, collective process affecting all aspects of society and thus the built-up environment, reminding of Otto Neurath’s legendary Modern Man in the Making from 1939. Absorbing Modernity deals with Modernism as inspired by the First Modernity. Monditalia shows the chaotic implications of the Second Modernity after the Second World War in Italy. Finally, Elements of Architecture hints at how under influence of computing and the Internet the elements of building—wall, floor, ceiling, window, door, fireplace—evolve to develop primitive forms of intelligence. Here Koolhaas puts himself self-consciously in the great tradition of canonical architectural tractates, from Alberti to Giedion’s Mechanisation takes Command from 1948. Far from an operational critique, his tractate is presented as a universe of concrete fragments of a Utopia or Dystopia we have forgotten to formulate, think through, and evaluate. Bart Lootsma is a historian, theorist, and curator in Vienna. The Elements of Architecture—a collection of the “fundamentals of buildings,” according to the brief—reads half like a trade show, and half like a catalogue. It’s the kind of compendium that a Ph.D. student could have put together, having stumbled upon a copy of Architectural Graphic Standards for the first time. Yet the exhibition misses the essential point about architecture and its underpinnings. You can’t simply extract the details; this is one of the most fundamental mistakes in design. Quality matters more than quantity; experience more than specificity. How you connect things, not how you pull them apart, creates the aesthetic moment. After all, it’s the part of architecture that you don’t see that matters most. Buildings are facts, but their essence is intangible. As for any treasured recipe, the ingredients need to be right, but it’s in the blending that one produces richness and delight. 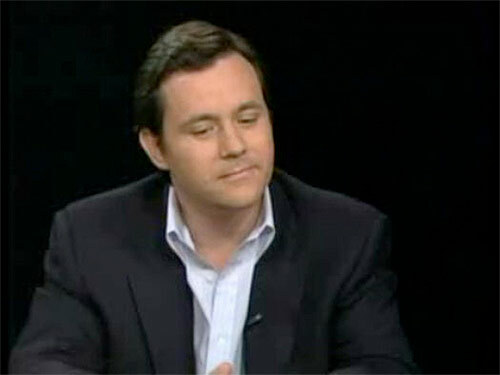 Rob Rogers is a principal at Rogers Partners in New York. The Venice Biennale is about Europe inviting the world to think, but the fact that the format is dictated by the Giardini’s set of national pavilions means that there is invariably a colonial sub-text, with the issue of embodying cultural identities in flag-bearing pavilions. Koolhaas has cleverly avoided this kind of response by doing away with architectural egos and starchitect status building, instead encouraging curatorial teams to look at the past in order to suggest credible ways to move forward. It works particularly well for the emerging powers like Korea, as their pavilion ignores the distinction between North and South, which is in effect a way of ceasing to look at the past and instead working on the best possible future for a reunited nation, a revolutionary approach after a century of geopolitical changes. But I am not convinced that Koolhaas’ upmarket tradeshow (Elements) is the answer to everything. Personally, I love going to hardware supply stores to stimulate my imagination about what I could do with copper pipes, some planks, and a few tools, but only on weekends… so Venice turned out to be a fabulous place to spend the weekend. Michael Mossessian is a UK-based architect. In his June 11th editorial for The Architect’s Newspaper, William Menking suggested—as others have as well—a connection between Paolo Portoghesi’s 1980 Strada Novissima and Koolhaas’ already much talked about Biennale. He wrote: “Portoghesi’s spectacular Strada was like Koolhaas’ ambition for Elements, ‘not to show images of architecture but to show real architecture.’” This could not be more true. I would add that Koolhaas pursues the same ambition has did Portoghesi 34 years ago: render architecture, the most social of all arts, intelligible to all, by using a simple grammar of signs and symbols (here elements) that can be read and understood by all. 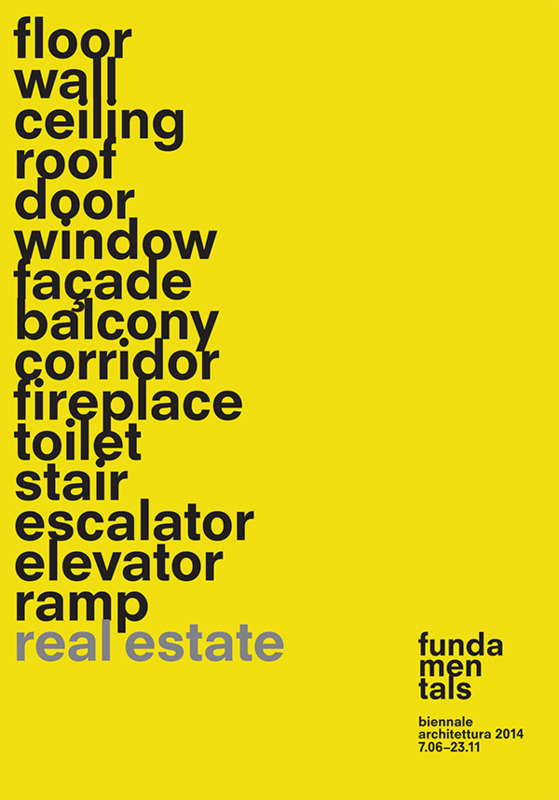 In other words, avoiding mere representation by putting men inside the street, in contact with architecture. Yet, I would also suggest a perhaps even stronger connection between the Monditalia and the 1980 interior street of facades. What was the ambition of Portoghesi when building the Strada Novissima? He and his collaborators wanted to fully and totally use the space of the Corderie (a secret space at the time, as the building, although an integral part of Venice’s industrial past, was not open to the public), turning it into a social space of representation, a theatrical and scenographic venue, allowing for a polyphony of emerging voices to be heard. So many resemblances: the strict rules given to each participant; the sense of an emerging generation; the international ambition, yet deeply embedded in Italian tradition; the scarcity of means; the linear progression; even the number of participants, just almost doubled. Because after all, 34 years have passed, and the Biennale, whether we like it or not, has become a big machine. Léa-Catherine Szacka is an architect and critic in Oslo. Both Lautner and Schindler’s early LA work begins with their take on Frank Lloyd Wright’s “open plan” adapted to the quasi-mountainous ravines of the LA hillside. Schindler’s work is heavily landscaped, perhaps reflecting the influence of Wright’s frequent visits to Japan, whereas Lautner’s work is often completely suspended from and set into its natural setting. Lautner’s idea of nature and site specificity differs from Wright’s seminal works like Falling Water, which are romantic, scenographic fantasies, often left unfinished (sometimes due to client’s lack of funds or a “falling out” with the architect). 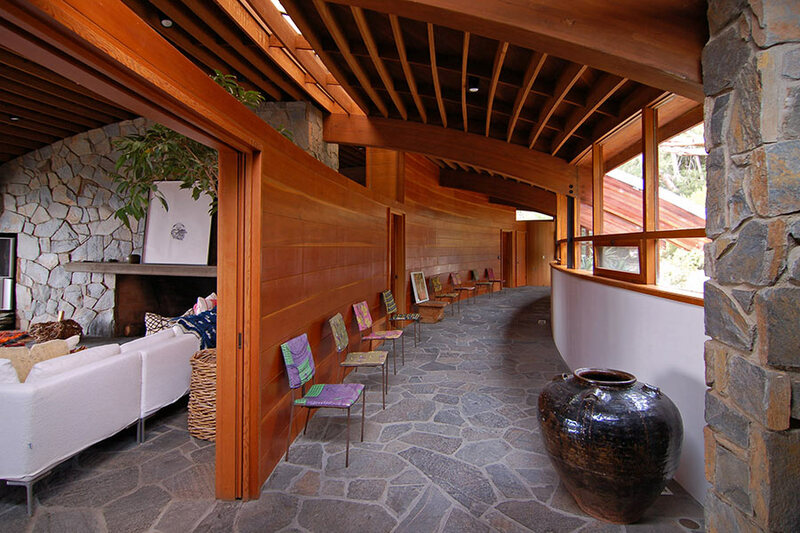 On the contrary, Lautner’s houses are built for permanence. 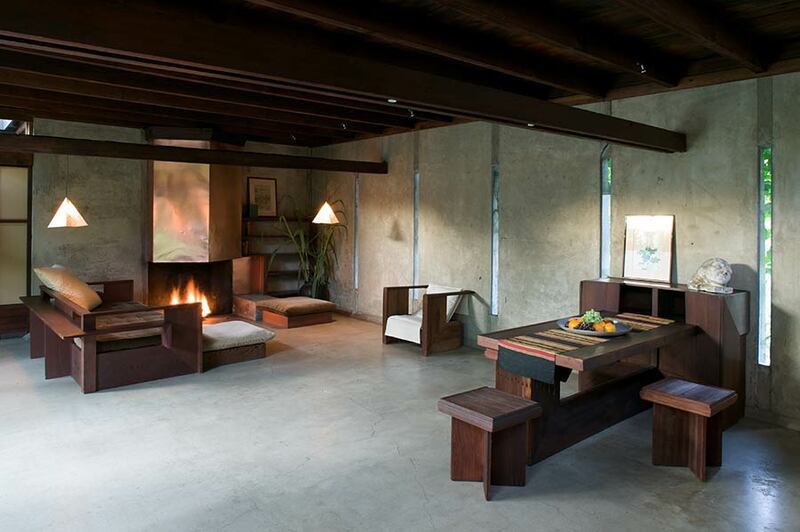 Lautner’s first LA houses, such as his own house in Silver Lake from 1940, are close in feeling and in their use of wood timbers to Wright’s work of the same and slightly earlier periods. Although Lautner’s classic work is associated with luxury, Lautner in his early LA practice, like Schindler (who he admired) experimented with low-cost houses, highway motels and gas stations, as well as rustic, isolated vacation cottages. 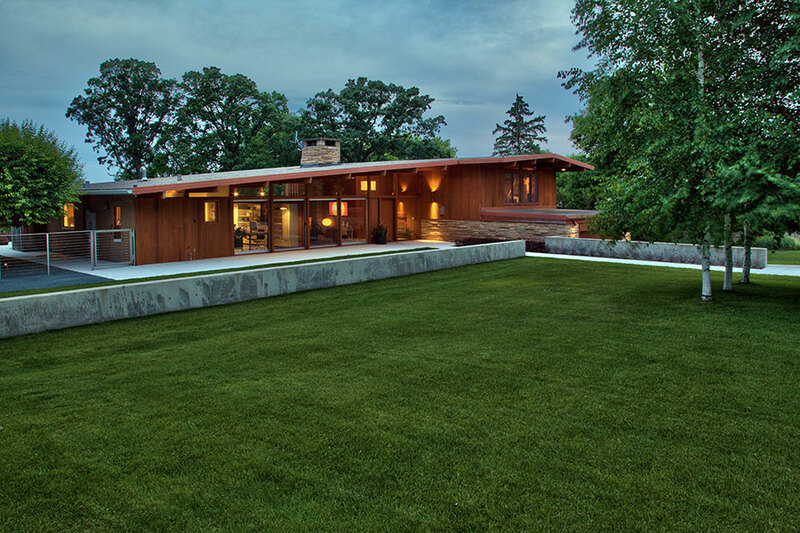 What is characteristic of Lautner’s classic houses is the centrality of the swimming pool in his design. 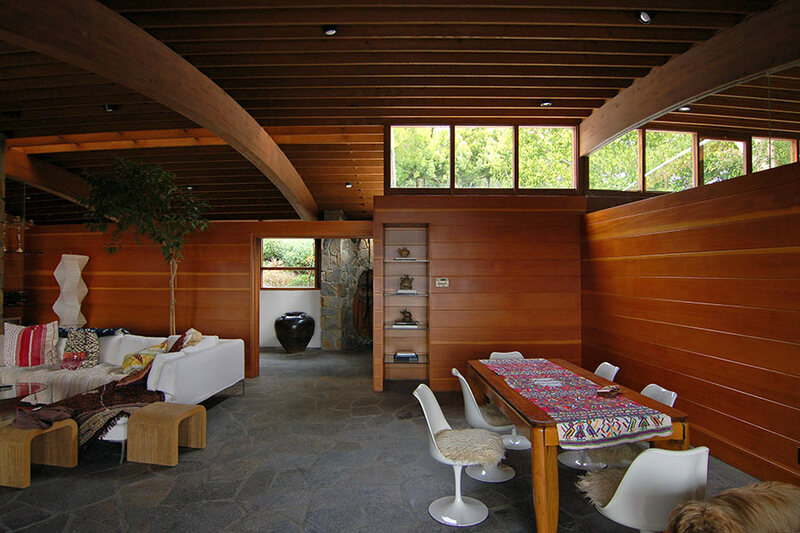 Lautner is a Cancer, like his fellow Cancer-sign architect, Robert Venturi, who based his early house for his mother on the central fireplace; Lautner also based his compositions on a central hearth-like focus, substituting the swimming pool for the fireplace. 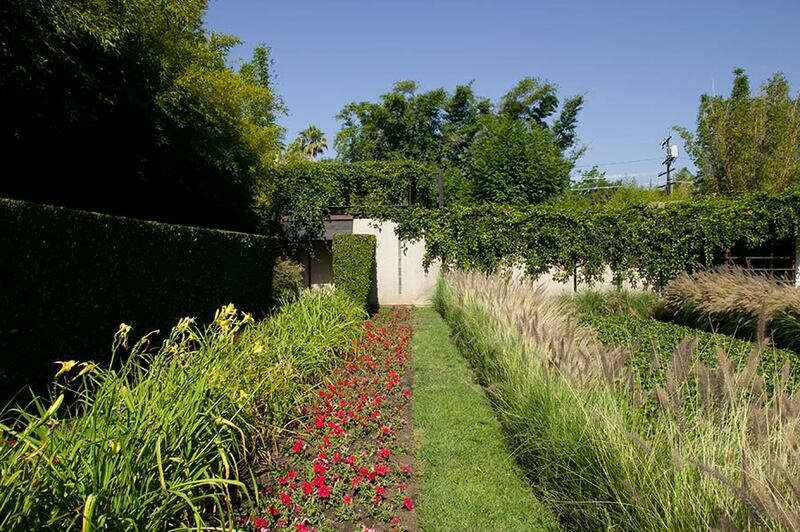 These LA houses incorporate the remnant of mid-western Wrightian nature worship, based around the Wrightian house’s fireplace, re-directed to Southern Californian hedonistic sun/water worship, epitomized by the terrace’s swimming pool. The pool was the center of Lautner’s luxury houses. (As a Cancer water sign, also connected with childhood memories, Lautner’s work seems to relate to the water-environment of the Lake Superior area where he grew up.) Lautner’s last works, sited near the Pacific Ocean, substitute the sea, surrounded by sky and earth, for the swimming pool, as central metaphors of man to nature. The organic metaphor in Frank Lloyd Wright’s work was perhaps first encountered by Lautner in Wright’s Racine Wisconsin S.C. Johnson Research Tower from 1944–1950, whose interior, supporting columns resemble large “inverted” lily pads, floating in the pond of a 19th century Crystal Palace–like Botanical Garden or perhaps gigantic, mushroom-like plants. The middle-to-late Lautner houses, which substituted concrete for wood as building material, often use undulating concrete, shell forms, which develop organically to link the house to the surrounding land or sea. Lautner by then had turned his attention to structural engineering, partly under the influence of the aero-space industry located in post-war LA, but also manifested in Lautner’s awareness of the works of post-war Italian structural engineers/architects such as Pier Luigi Nervi, who had used reinforced concrete in curvilinear, folded forms, as well as the concrete structures of Baldessari. Another major influence on Lautner’s practice was the shell forms of the Mexican, Felix Candela, as well as the forms of the Brazilian Oscar Niemeyer. 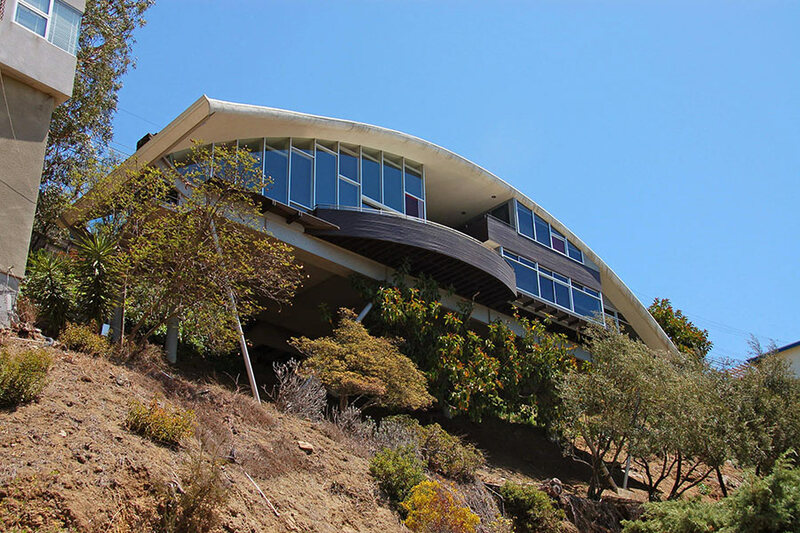 Lautner’s Malibu Cliff House, 1990, and his Acapulco Marbrisa House, 1993, have echoes of Nervi’s spiraling forms as well as relating to Saarinen’s TWA Airport Terminal at JFK as well as his Yale, New Haven, Ingalls hockey rink. Lautner’s first use of reinforced concrete is in the roof of his 1963–89 Sheats/Goldstein House, whose forms echo Louis Kahn’s concrete ceiling in the Yale University Art Gallery. 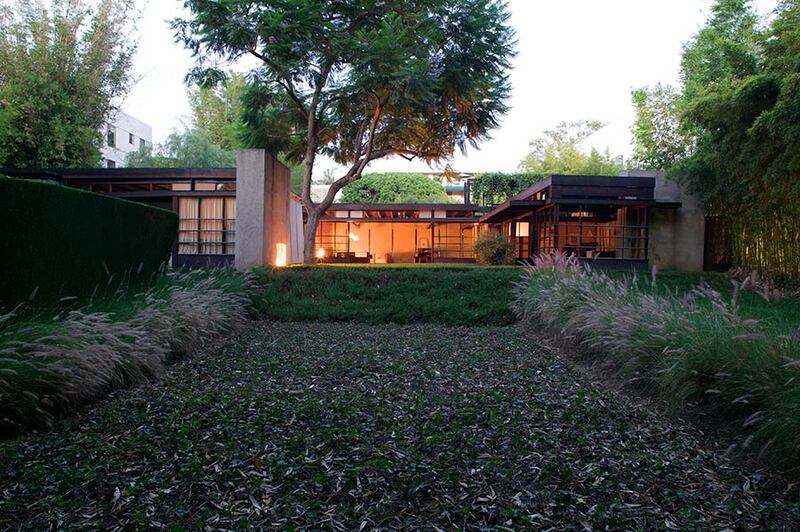 The Sheats/Goldstein House was the first Lautner house I personally experienced. The house is precariously perched, like a tree house, in a wooded area on a hillside overlooking Beverly Hills. In this house, views of the swimming pool are central. From the houses’ upper level we first glimpse the pool seen from above; the pool is situated at the middle, terrace level of the house. On a lower level we can actually look through the pool’s water from an underwater vantage point through a sheet of thick, transparent glass, rather like the view of penguins in their underwater habitat we see in zoo architecture. The house is surmounted by the concrete roof, resembling a Louis Kahn in its geometric form, and seems to be a metaphor for the light experienced in a timber house in the forest wilderness (not unlike the summer cabin in Michigan where Lautner was born). Lautner’s Sheats/Goldstein House uses 750 drinking glasses set into the roof’s concrete to re-create a speckled, flickering light suggesting a primeval forest canopy. The house makes use of many, contrasted, interwoven textures, overlapping layers of thick quasi-transparent glass, wood paneling, rug and ripped floor surfaces, all of which interact with shifting glimpses of light and fragments of outside foliage lightly reflected on the interior glass partitions and windows. Lautner employs the use of overlapping layers of glass as interior partitions to capture surface light reflections of people moving around the transition spaces linked by various staircases. This interior glass reflects and connects people’s gazes and bodies with the doubling indoor/exterior sunlight. These glass reflections also intermingle to the reflective surfaces of the water in the pool. The internal glass relates subtle movements of people transiting the space with reflections of the various textures of the wall surfaces and floor coverings as well as the flickering outdoor light. 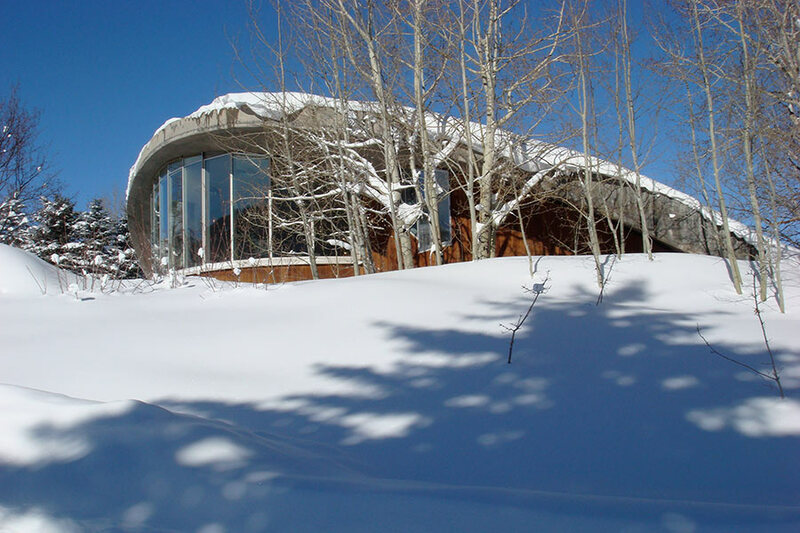 Lautner’s final works, in their gentle, curving, enfolding, somewhat organic surfaces evoke and interconnect the house’s interior and exterior surfaces with the surrounding natural forms—sea, earth, and sky. Lautner described the concrete roof of his late, Baja California seaside Marbrisa House as “a roof to sandwich life between earth and sky to the surrounding sea.” His Michigan lake/wilderness natural childhood experience was deeply influenced by ideas of Nordic, Germanic, and Irish nature mythology as well as by his philosophy teacher father and his artist mother and it is now re-oriented/re-created in the new Pacific Ocean setting of Southern California. The exterior of Schindler's house on Kings Road. Written by Robert Sweeney, president of Friends of the Schindler House, and Judith Sheine, head of the department of architecture at the University of Oregon, Schindler, Kings Road, and Southern California Modernism makes for a simple, elegant, and sociologically stimulating account of Schindler’s first independent project. While the house itself is wonderfully documented in a compact arrangement of essays, photographs (by Timothy Sakamoto), drawings and letters, it is the unfolding of Schindler’s complex evolution as an activist engaged in Space Architecture that suggests that the home itself can be conceived as a vessel of collaboration and social change. The somewhat complicated reception of the Kings Road house speaks to a fundamental difficulty in identifying the project’s aesthetic allegiances and its placement in history, suggesting that it may not only be an original work, but also the frontrunner of what has become a contemporary architectural paradigm indicative of intellectual life in Southern California. Mark Mack, co-founder and former editor of Archetype Magazine, provides a very brief introduction that sets up the profile of Kings Road as an experiment in “Bolshevik humanism” and “spatial looseness” that is as interesting as its occupancy by “extraordinary people floating through and residing within.” Mack goes on to further characterize the house as a “classless and liberated social arrangement of rooms in a natural landscape, where rooms have no labels, like ‘bedroom’ or ‘living room,’ instead only noting the occupant, the human, and his or her relationship of goodwill with others sharing the world.” Though its many innovations may be reduced to primal functionality and the seamless integration of nature and shelter, the cultural implication of the house at Kings Road anticipates the “optimistic societal drift” of the 1960s. 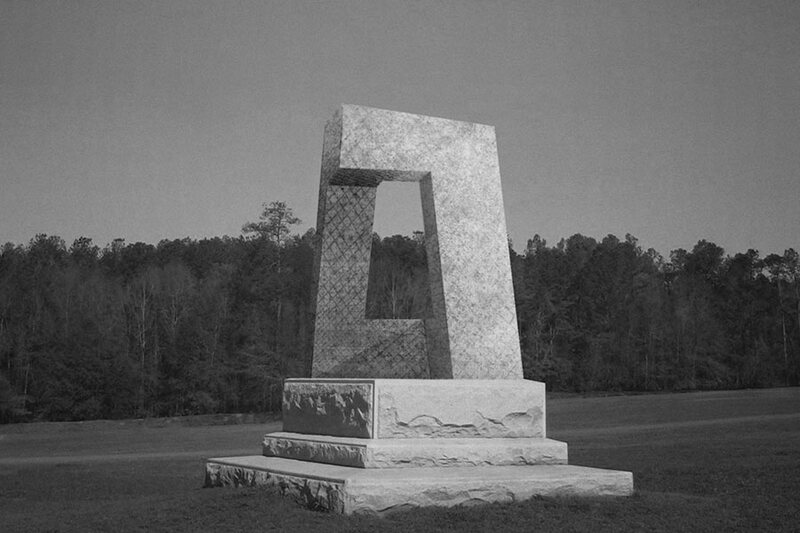 Mack goes on to establish Schindler’s aesthetic affinity with Archigram and Superstudio. His most important point, however, involves the “negotiated collaboration” between Schindler and his wife Pauline, who he describes as a “socially conscious community activist.” It was their shared goal to create an environment of “serious intellectual exchange” that was free from “exploitative and capitalistic reality.” The home itself and its genesis was, in so much, a labor of love that grew out of a collaborative, romantic condition and a political position that could be considered Left Wing or radical. A brief text by Sweeney and Sheine touches on this radical quality in terms of the project’s early reception, publication challenges and the home’s “incomprehensible” appearance, which ultimately grew out of Schindler’s spin on the ideas of Otto Wagner, Adolf Loos, and Frank Lloyd Wright. 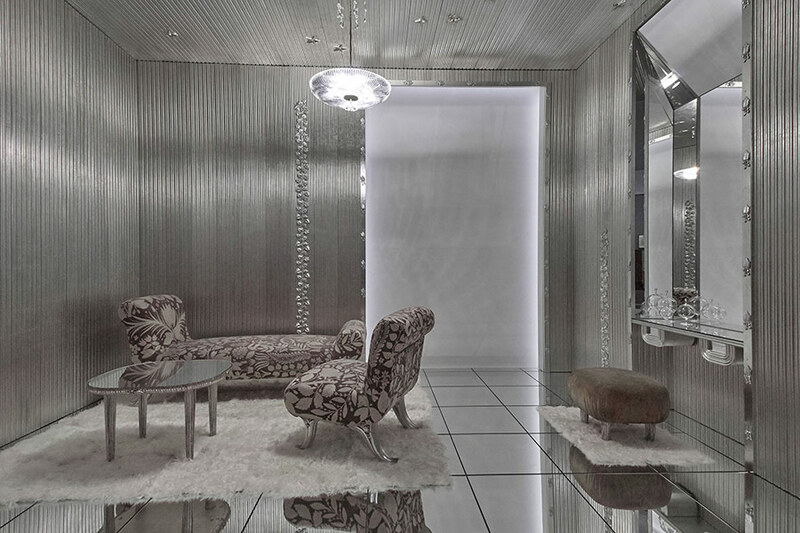 Inside Schindler's Kings Road House. Sweeney follows with an essay that illuminates Schindler’s background in Vienna, describes his early apprenticeship with Hans Mayr and Theodor Mayer, discloses the influence of Loos, and highlights the impact Wright’s Wasmuth Portfolios (a two-volume folio of 100 lithographs published in 1910) had on him. This nexus of influences inspired Schindler to make a move to Chicago, where he began working with Ottenheimer, Stern, and Reichert. We learn from Sweeney that Schindler’s correspondence with Frank Lloyd Wright during this time proved strategic. In 1917, Schindler went to work for Wright in a senior capacity—he ran the office in Wright’s absence and doubled for him “with clients who wanted Wright.” Sweeney does a thorough job at clarifying Schindler’s relationship with Wright and charting his professional transitions that led up to his marriage. Wright, it appears, made as much an impression on R.M. as he did on Pauline. There appears to be an inherent contradiction in her indulgence in Taliesin and her quest to lead a “simple and primitive life.” Nevertheless, the Schindlers were deemed Socialist and claimed to be Communists. The concept of a “communal lifestyle” would feed into the ideology of Kings Road, where there is clearly a governing economic determinant at work as early as the project’s siting in the flatlands, between Hollywood and Beverly Hills. 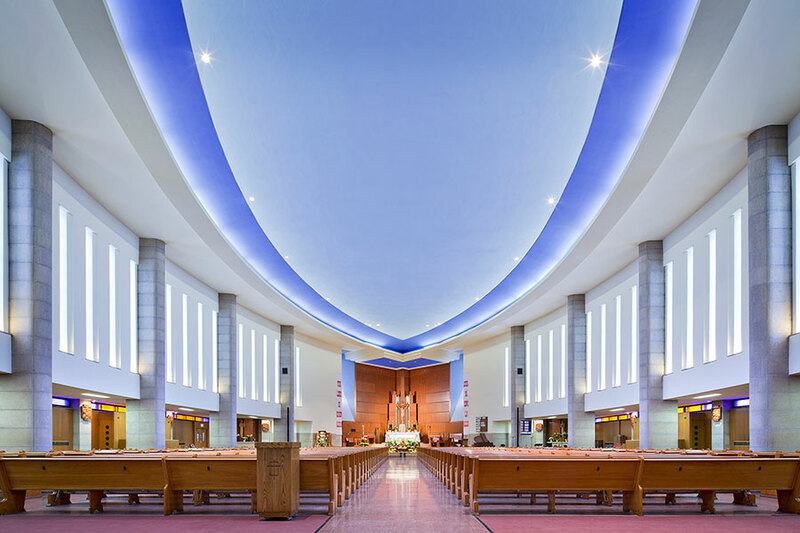 Sweeney gracefully handles Schindler’s history with Wright, the marriage to Pauline, their move to California, project planning schemes, innovative technologies employed during construction, project completion, and shortcomings. The Sweeney essay is visually supported by a delicate watercolor perspective produced by Schindler (very much in the style of Jugendstil), construction photos that document the “tilt-up” cast concrete wall construction, drawings (plans, elevations, typical details), and archival photos of the house taken upon its completion in 1922. According to Sweeney, from the beginning, “the house served as a salon.” Based on shortcomings, it would seem that while Kings Road remains significant in its treatment of “space, climate, light, and mood,” its performance was questionable from the beginning. 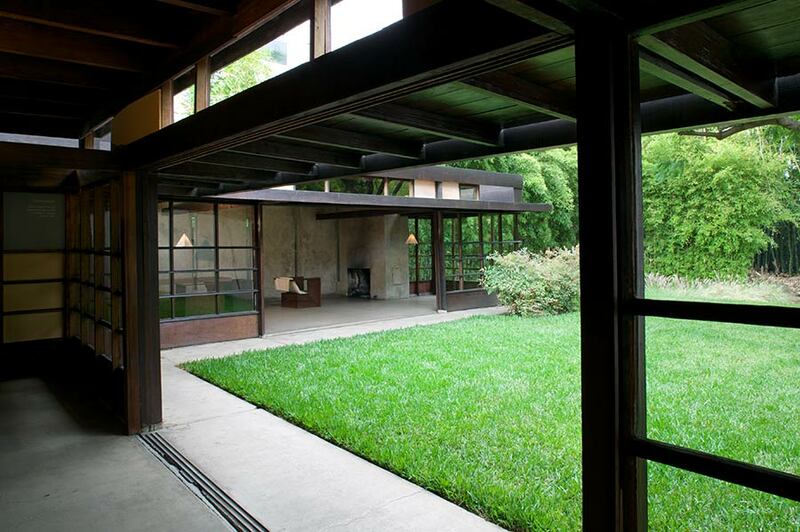 As a result, as representative of the tenets of a presumably distinctive, Southern California architecture, one must closely evaluate the terms of the vernacular Schindler’s house proposes. The book evolves into a prose-photographic interlude in which Sakamoto’s images provide the greatest insight into the original intention of the Schindlers’ home, and what it has become: set within ever-maturing flora and fauna, carefully manicured to some higher specification, a grown-in masterpiece with soaring, cantilevered roof lines. These photographs, in color and taken from early morning to dusk, describe the vernacular succinctly. From them one deduces the house’s asymmetrical planning and an integral fluidity in which clerestory windows, sliding doors and walls, full-height glass partitions, ample overhangs, and a juxtaposition of materials (redwood, mahogany, concrete, insulate) produce an overarching sense of horizontality and flatness. Slit windows in R.M.’s studio articulate a practical response to solar position as well as a certain monasticism that is pervasive throughout. Wright’s preoccupation with Japanese works left an unmistakable impression on Schindler. Sheine’s essay, titled “Pre-Everybody,” fights to establish Kings Road as a trendsetter that influenced Wright, Neutra, Gregory Ain, Harwell Hamilton Harris and Raphael Soriano, in spite of the fact that it remains, to a degree, a mystic provocation. Sheine emphasizes Schindler’s conscious attempts to integrate theory and practice in his work. Where Sweeney’s essay provides general background, it is clear that Sheine’s agenda involves the demystification of Kings Road. It is from Sheine that we begin to see the house in a broader perspective, and we gain a breakdown of the theoretical underpinnings that suggest that Kings Road was in fact a physical manifestation of Schindler’s 1912 manifesto entitled, Modern Architecture: A Program. Sheine implies that while materiality and structure are overly expressed in Kings Road, it is their ability to define space that is of higher value, and combined with “the design of interior space and its connection of outside spaces and views,” there is formed a signature of sorts for the vernacular. Sectional complexity in Schindler’s work and a tendency to develop the site plan along a diagonal axis would also form the basis of the architect’s subsequent designs. As Sheine unpacks the theory, she inhabits other projects and their spatial patterns. Still, upon completion of Sheine’s essay, one is left to contemplate those aspects of Kings Road that correlate Modernism, as well as those that qualify a distinctive Southern Californian tendency. If we place the discussion in the context of character, we could say that there are identifiable traits: a fundamental indoor-outdoor design strategy based on climate response, the incorporation of cross-ventilation, the use of overhangs to produce shade, extensive use of natural light by way of sectional complexity and clerestory windows, three-dimensional modularity, prefabricated structural elements, use of local materials, expansive areas of glass, movable partitions, flat roofs, the integration of architecture and landscape, a horizontal datum, and single-storied, dynamic plans, oriented to views. Beyond formality, it is the political position of Kings Road that holds together its syncretism. Its streams of logic and unresolved ending, in the end more like Modernist poetry, clearly register leaps in time. Sweeney and Sheine, in their respective essays, mirror the Schindlers’ enthusiasm in this highly recommended, collaborative romance. The Vienna Model: Housing for the 21st Century City Austrian Cultural Forum New York Through September 2 An upcoming exhibition at the Raimund Abraham-designed Austrian Cultural Forum in Midtown Manhattan, entitled The Vienna Model: Housing for the 21st Century City, presents 37 reasons why we should look towards the Austrian capital when it comes to public housing. Curated by AN’s William Menking and head of the Department of Housing Research for the City of Vienna, Wolfgang Förster, The Vienna Model will exhibit a collection of case studies of Viennese public housing spanning the past 95 years and representing the work of dozens of architects, from contemporary innovations to classics by Josef Hoffman, Adolf Loos, Richard Neutra, and Margarete Schütte Lihotzky. 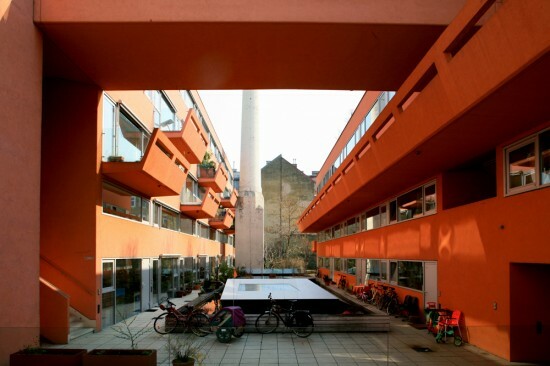 With 60 percent of Viennese living in municipal housing, and the city continually topping the ranks of the world’s most livable (check here, here, and here), there is obviously something to learn from Vienna’s example. The show opens April 16th and will run until September 2, before heading off to Los Angeles, San Francisco, Washington D.C., and finally back to the Imperial City. 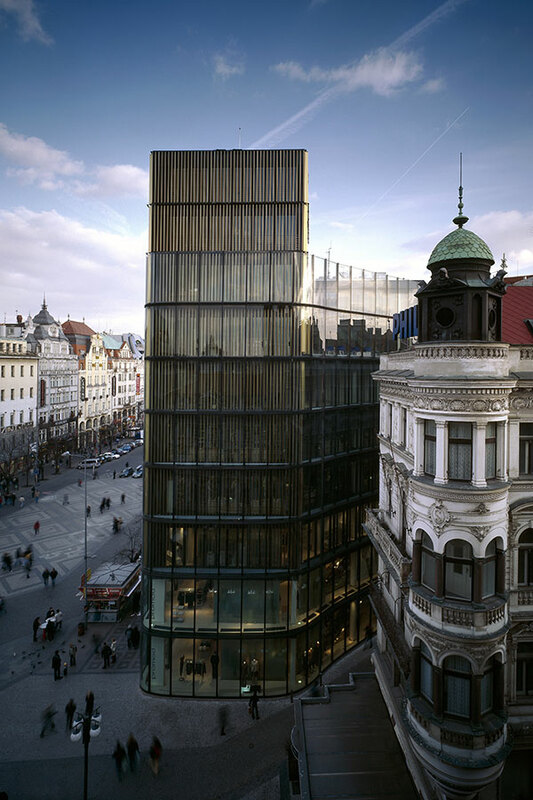 Founded in 1864 as the Imperial and Royal Austrian Museum of Art and Industry, the MAK has matured into a happening place of international stature for art and architecture with hubs in Vienna and Los Angeles, where the MAK Center resides in the Schindler House. 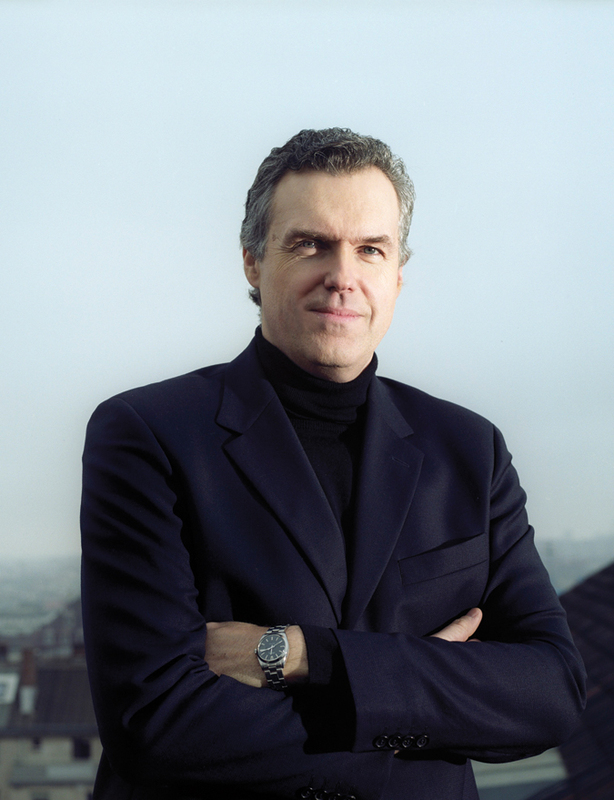 Earlier this year amidst considerable controversy, Peter Noever departed as director, and on September 1, Christoph Thun-Hohenstein assumed the post. A former director of the Austrian Cultural Forum in New York (1999–2007) and director of departure, the city of Vienna’s funding agency for creative industries including architecture, design, fashion, and the art market, Thun-Hohenstein sat down with Liane Lefaivre to talk about the traditions and the future for the influential institution. The MAK is the second oldest Museum of Applied Art in the world after the Victoria and Albert Museum in London. How do you see your mission with regard to this tradition? Well, although I greatly respect this tradition, my mission is clearly to steer the museum into the 21st century. We have about four sections: applied art—though I am not very clear what it is—design, architecture, contemporary art, and intercreativity, that is interdisciplinary ideas and projects involving those fields. To me it is important that the MAK does not become solely a design museum or a museum for the decorative arts. All these things belong together. What do you make of Peter Noever’s legacy? I have inherited Peter Noever’s by now famous exhibition showcase rooms that occupy the first and second floor of the main building of the MAK. He has done a really great job with this and we will keep these rooms intact for the time being. My own emphasis will be on the huge special exhibition spaces that comprise a total of 3,000 square meters on two floors. We will be using them to present integrative exhibitions that work with the collections in new ways to address key topics involving several disciplines. What will be special about such integrative exhibitions? I am a huge fan of the thematic shows on new developments and interfaces at MoMA, especially what they do in the design department. Paola Antonelli has mounted some exceptional shows, like Design and the Elastic Mind, and there is the new show that explores communication between people and things in our digital era. These are examples of highly relevant topics the MAK also has to address. For me it is important to mount shows that bring different fields together, and to explore how applied art, design, architecture, fashion, and art can contribute to positive change in terms, most particularly, of ecological responsibility and social innovation. A museum of applied art should actually set the standard for these activities. What are your plans for the MAK Center in Los Angeles? Is it going to be business as usual? The MAK Center in Los Angeles is a very important part of the MAK’s international reputation. The United States is such a great generator of innovation and creativity that it is wonderful to have this link. The scholarship program in architecture and the visual arts is excellent and will certainly be continued, and some of the young architects and artists will be shown at the MAK in Vienna in the years to come. We will also showcase the most experimental Austrian architects in Los Angeles. Any statement you would care to make about the architectural policy of the MAK? It’s too early to go into specifics. I have a long list of ideas. But the focus in general will be on positive change, or, to be more precise, on the contributions architecture (as well as design, applied art, and contemporary art) can make to positive ecological, social, and cultural change. This involves architecture to a great extent. Architects are instrumental in providing new impulses between different generations, in responding to ecological sensibility, and promoting cultural innovation. These positions are underexplored at the moment. They need to be enhanced. Another area that needs to be revived is the legacy of Adolf Loos. His continuing impact on the contemporary world merits a closer examination, and we are exploring these possibilities with eminent scholars here and in the States. And, of course, the continuing relevance of Josef Hoffmann. The opposition between Loos and Hoffmann about the status of ornamentation sparked one of the debates that still resounds today in the digital age. The MAK has tended to feature starchitecture recently. Will you continue in this direction? I am not interested in star architecture per se. I am interested in architects who have a clear vision for the future and are dedicated to positive change. Some of these are star architects, others are not. We will also present lesser-known architects. What is important is how architects deal constructively with the problems of our civilization. to write a book about the architectural and cultural history of the last 100 years, "from Adolf Loos's Vienna and the utopian social experiments of post-revolutionary Russia to postwar Los Angeles and the closing years of the 20th century," as Nicolai describes it. That's the level of ambition we've come to take for granted in Nicolai. He's a critic whose seven-year run has been distinguished by qualities of unfailing intelligence and integrity and the kind of relentless journalistic drive that propelled a worldwide search for steel-and-concrete manifestations of big, important ideas. His recent series on efforts to use architecture to transform the Middle East was only the latest example. And a grand one it was. On a different scale, I have another favorite, a review that shows off all of Nicolai's discernment, courage and skill in a smaller package. That was his appraisal of our new building. There was a lot he didn't like about the place and he said so - there's the courage part. On the discernment front, there are fascinating observations about the building's interplay with the history and ideals of modern journalism. Skill? Look at the direct and good humored way he handles the problem of reviewing the boss. No doubt there's much more where that came from. There's a ton of Nicolai's trademark ambition in the plan for his book, to be published by Farrar, Straus and Giroux, which aspires to put a century of architecture into the kind of social and political context he always aimed for within the more limited constraints of newspaper writing. We'll miss him. He'll miss us. The question is will the readers, too? The sporadic critic was known more for chasing down exotic locations and predictably championing all things Californian than analyzing local conditions and his even-handed voice sometimes had us all missing the impassioned harangues of his predecessor, Herbert Muschamp, but at least he was there writing about architecture for the general public, one of the last of a rare and rarer breed.